In this project, we asked over 1,000 people to estimate their financial preparedness for costs associated with major life milestones. 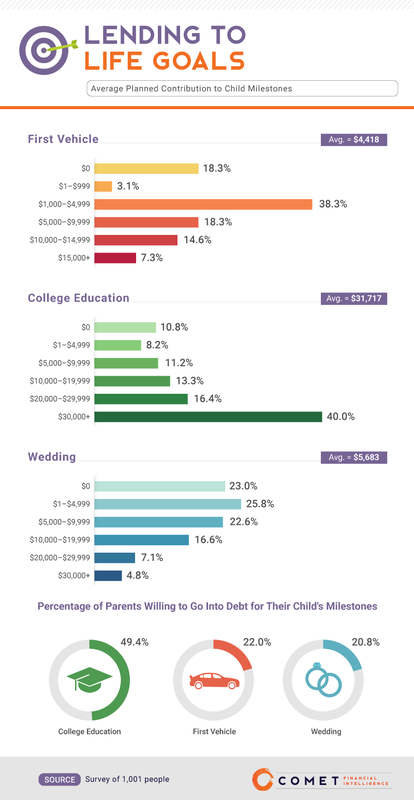 Are most people prepared for the expenses associated with raising a child and their own aging, or are they clueless about the financial burdens that lie ahead? To compare your own financial preparedness to that of the average American, keep reading. 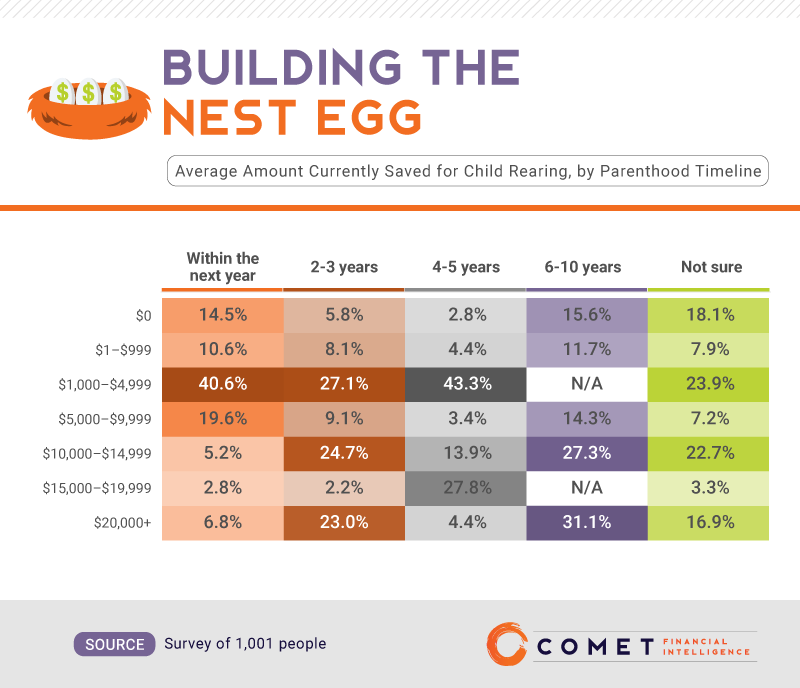 Our data suggest many who plan to become parents soon haven’t saved much cash for a child’s arrival. Indeed, more than 65% of people who planned to have a child within a year had less than $5,000 saved for child-rearing expenses. In some ways, the cohort who planned to have kids in two to three years was more fiscally prepared: 23% of this group had amassed $20,000 or more in savings for future children. Even a sizeable portion of those with far-off parenting ambitions saved a healthy chunk of change. Of those who planned to have a kid in six to 10 years, more than 30% had saved at least $20,000 already. 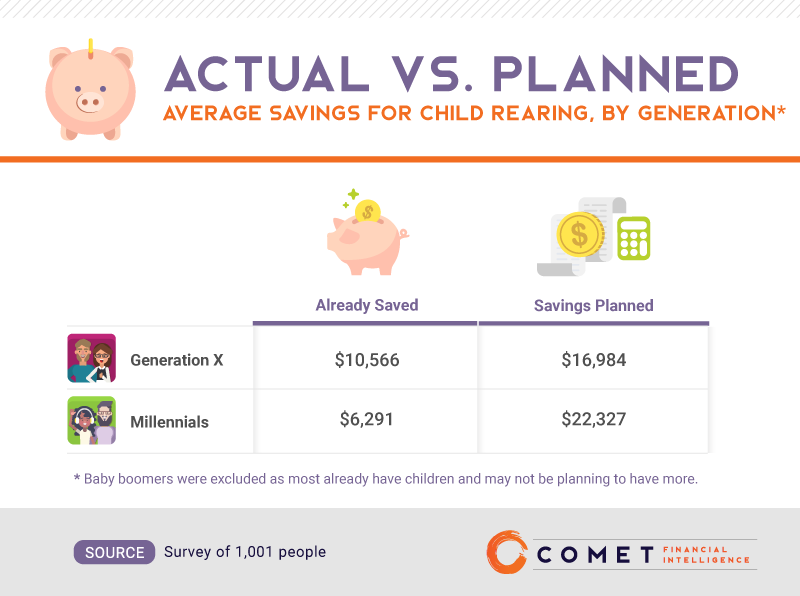 Interestingly, Gen Xers typically had more saved for future children than their millennial counterparts – but they also had more modest savings goals overall. On average, millennials planned to save over $5,000 more than Gen Xers to cover child-related expenses. This projected cost difference could stem from the gadget-centric way in which millennials are redefining parenting: From intelligent bassinets to wearable baby tech, the latest and greatest baby products can cost hundreds of dollars – money Gen Xers might not plan to spend. How Much Cash to Raise a Kid? Many of our respondents actually overestimated the typical financial burden of raising a child: More than a third guessed associated expenses would exceed the federal average of $233,610. Interestingly, those who already had children were actually more likely to judge average costs at the highest end of the spectrum than those without kids. Nearly 3 in 10 parents guessed raising a child costs $500,000 or more, whereas 22.7% of non-parents said the same. In fact, current parents typically spend less money on their next child compared to first-time parents, likely because hand-me-downs cut costs. 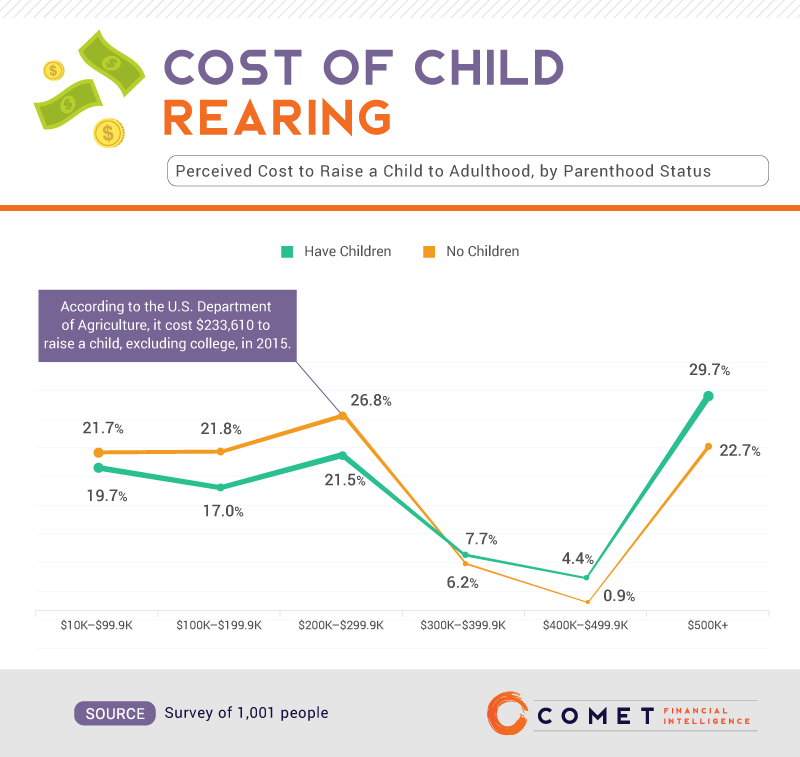 A significant number of respondents (including those who already had children) underestimated child-rearing costs as well. Nearly 20% of respondents with kids guessed raising a child cost less than $100,000, and 17% estimated costs fell somewhere between $100,000 and $199,999. Although the costs of raising a child do differ substantially by region, these estimates fall well below actual expenses anywhere in the country. If our respondents’ estimates of the total cost of raising a child were often inaccurate, which specific expenses did they misjudge? With regard to many of the major products used to care for young children, such as a crib or stroller, our respondents overestimated the average price by more than $100. For more minor purchases, such as pacifiers, feeding bottles, and diapers, their estimates tended to be more accurate. For each of these items and services, however, perceived costs exceeded the true price. Child care costs are a source of continuing frustration for many working parents, who find that the price of high-quality care consumes much of what they earn. According to our data, a month of child care may actually be more affordable than most imagine – although, at $836, it’s certainly not cheap. Child care costs also vary dramatically by location, which might explain why some respondents overshot the national average. By some estimates, parents in many places are spending more than $2,000 a month on child care. Although parents are obligated to shoulder the costs of their children’s basic necessities, how many plan to pitch in on nonessentials as they grow older, such as buying their child a car? More than 1 in 5 parents said they’d chip in $1,000 or less for a child’s vehicle, and 7.3% said they’d spend $15,000 or more on their teenager’s wheels. In terms of financing a child’s wedding, extreme differences of opinion were even more evident. Nearly a quarter planned to contribute nothing at all, whereas roughly 12% anticipated spending more than $20,000 on a child’s nuptials. Parents planned to shell out far more on their children’s college educations, anticipating spending $31,717 on average. Thanks to the ever-increasing costs of higher education, however, that total would only cover two years at a public college at current rates. Additionally, nearly half of parents said they’d be willing to take on debt to finance a child’s education. Some financial experts urge parents to focus on their own retirement savings instead, letting their kids take on their own loans. However, for those parents who are shouldering the burden of their child’s loans, another financially savvy tip is to refinance those loans to avoid overpaying each month. Putting aside the potential costs of raising children, how many of our respondents could weather a financial emergency themselves? 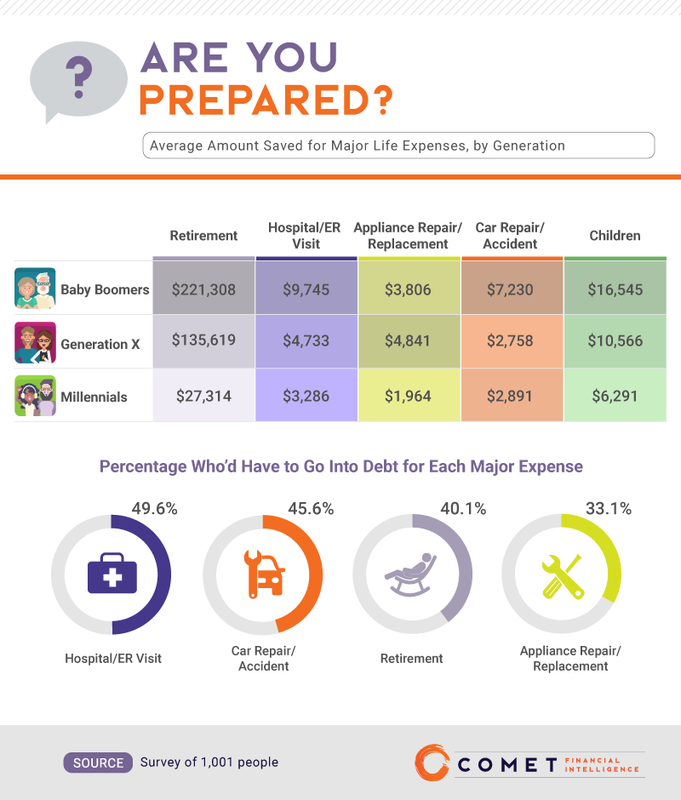 Relative to other generations, baby boomers understandably possessed greater retirement and emergency medical funds than did younger generations; at their advanced age, they’re more likely to need them in the immediate future. But Gen Xers and millennials also had less than $3,000 saved for a potential car repair, a sum that could vanish quickly given the price of common repairs. About half of respondents said they’d have to go into debt if they needed emergency room or hospital services. For those considering having children soon, it’s imperative to note delivery care can be quite costly, averaging $3,500 per stay without accounting for prenatal and postpartum services. If the costs of an ER visit could push you into debt, so might the health care required during a pregnancy, especially for those with limited health insurance coverage. Whatever your immediate and long term goals, the costs associated with your dreams can seem daunting. Our findings suggest many misunderstand the true costs of major life events, so perhaps Americans have good reason to consider their expenses more carefully. But lifestyle choices cannot be assessed in financial terms alone. Unlike an investment that can be judged in dollars, the life you build should be rooted in your values. While fiscal prudence is always important, first find a life path that speaks to your passions. From there, smart decisions can make it all possible. Whatever the future holds for you and your family, you’ll need a financial plan built on your personal goals – plus unplanned challenges along the way. At Comet, we offer expert advice to help you conquer any financial hurdle, whether you’re saving for your kid’s education or paying down your own college debt. We’re here to help you grow your wealth, so you don’t have to go it alone. We collected responses from 1,001 people from Amazon’s Mechanical Turk. 49% of participants were female, and 51% were male. Participants ranged in age from 18 to 78, with a mean of 35.6 and a standard deviation of 10.4. Participants were excluded if they were clearly not paying attention (e.g., failed attention check question or entered obviously inconsistent data). We weighted the data to the 2016 U.S. census for income and benefits (in 2016 inflation-adjusted dollars) of Americans. No statistical testing was performed. For the asset on costs and timelines, respondents were asked to write in their answers. All responses were then grouped or averaged, depending on the asset. For “Cost of Child Rearing,” the average cost figure included was found in a report from the U.S. Department of Agriculture. 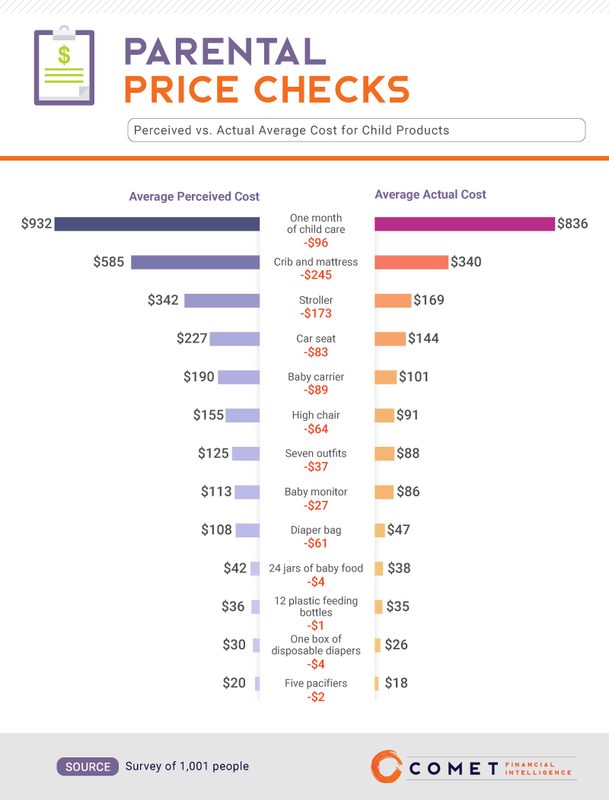 For “Parental Price Checks,” the average prices were calculated using data averaged from Investopedia and BabyCenter.com. You’re welcome to use our information and images for non-commercial purposes. If you do, simply link to this page to attribute our team for our work. Just like parents, we appreciate a little credit now and then.